>>From the Parliamentary Poet Laureate website. Photo from Parliamentary Poet Laureate website. 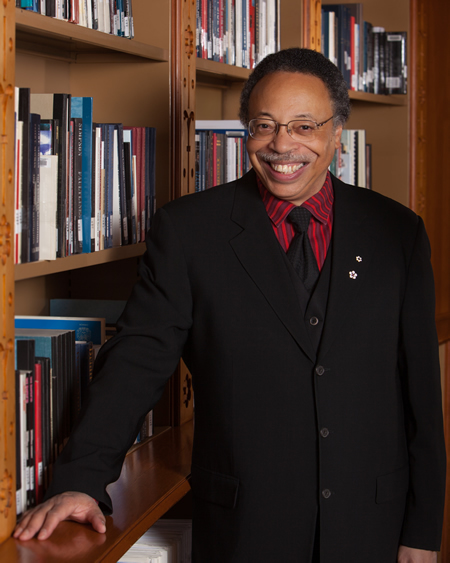 George Elliott Clarke was selected by the Speakers upon the recommendation of the Selection Committee chaired by Sonia L’Heureux, Parliamentary Librarian and composed of Guy Berthiaume, Librarian and Archivist of Canada; Graham Fraser, Commissioner of Official Languages and Pierre Lassonde, Chair, Canada Council for the Arts. Born in Windsor, Nova Scotia in 1960, Mr. Clarke is a seventh-generation Canadian of African-American and Mi’kmaq Amerindian heritage. Among Mr. Clarke’s many honours are the Governor General’s Literary Award for Poetry, the National Magazine Awards’ Gold Medal for Poetry, the Dr. Martin Luther King Jr. Achievement Award, the Pierre Elliott Trudeau Foundation’s Trudeau Fellowship Prize and the Dartmouth Book Award for Fiction and the Eric Hoffer Book Award for Poetry. He has also been appointed to the Order of Nova Scotia and to the Order of Canada at the rank of Officer. Mr. Clarke holds eight honorary doctorates. He has recently completed his three year term as Poet Laureate for the City of Toronto. Federal legislators created the position of Parliamentary Poet Laureate in 2001 to draw Canadians’ attention to the reading and writing of poetry. Pursuant to the Parliament of Canada Act, the Poet Laureate performs a range of duties, including: compose poetry, particularly for use in Parliament on occasions of state, sponsor poetry readings, advise the Parliamentary Librarian on the Library’s cultural collection, and perform related duties at the request of the Speaker of the Senate, the Speaker of the House of Commons, or the Parliamentary Librarian. Biographical notes and a photo of George Elliott Clarke are available on-line at www.parl.gc.ca/poet.